At first glance, this week’s unitasker selection seems like it could be helpful. It’s a device to organize shoes, which doesn’t seem like such a bad thing … until you realize a few things about the product that actually make it unhelpful. The dipr seems to be more clutter for the kitchen than a tool to simplify your life. The Snack Spout wants to make eating junk food even easier … because apparently it was too hard to eat junk food before now! 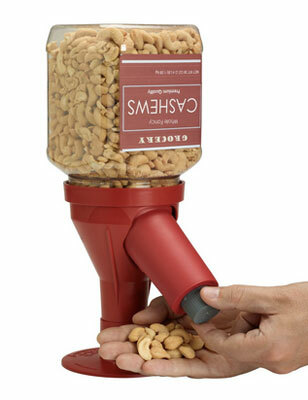 For people who buy snacks in bulk, they can attach the large container to this device and then use their hands to repeatedly access the snacks. The product description claims it’s more sanitary to use your hands to get the snacks from this device, but I personally think it’s more sanitary to use a scoop and bowl when eating snacks (and hey, look at that, science agrees with me). Sure this thing is kind of cute, but thinking about the amount of bacteria on this dispenser also makes my tummy a little queasy. Blergh. Thanks to reader DK for helping us find this unitasker. How to deal with unidentified found objects, especially when they’re things you might end up needing later. 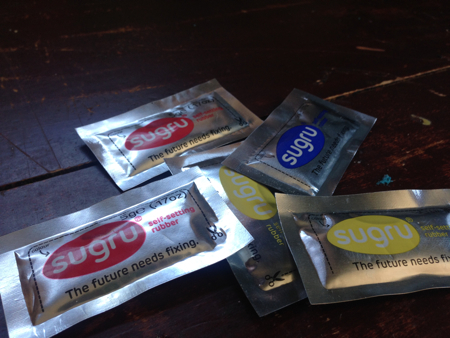 A few weeks ago I wrote to Erin and said, “I’d like to review Sugru for Unclutterer.” She was intrigued, so I ordered a set, and after weeks of using the product I wanted to share the results of my test-drive with you. Sugru is a “self-setting rubber” invented by Ireland’s Jane Ní Dhulchaointigh. It feels like Play-Doh when initially removed from its package and then hardens, yet remains flexible, after being exposed to air for about a day. People are doing all sorts of creative and useful things with it, and that’s why I wanted to review it. For me, part of being an unclutterer means a commitment to frugality, and I use the New England definition of frugal: nothing is wasted. Since Sugru lets you repair or improve on a huge number of devices in and around your home, it prevents those things from becoming clutter. 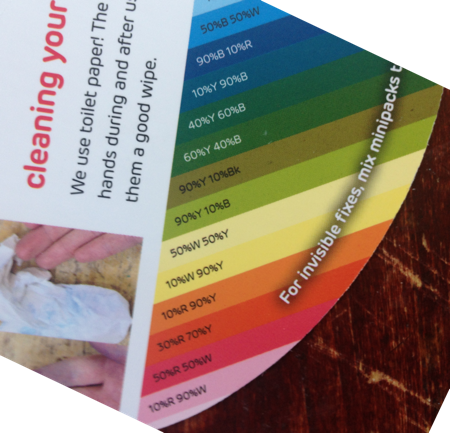 The Sugru packaging includes a list you can populate with future projects, instructions, many photos, use ideas, and a super handy color chart. I received four colors (other combinations are available), and the chart explains how to combine them to produce a variety of hues, so that you can match whatever you’re trying to fix or improve. The Sugru itself comes in sliver, 0.17-ounce packages that resemble the condiment packs you might find at a fast food restaurant. My goal was to both fix something and improve something; both were met easily. As mentioned earlier Sugru is nice and soft out of the package, with that “I just want to squish it forever” feel. (Note: that the color does come off onto your fingers. Not a lot, and it’s easily removed with a wet wipe, but still worth noting.) Its consistency made it an obvious choice for my two projects. The second project was the “fix.” I have an Amazon Fire TV that runs a little hot. So, I decided to add some feet. After molding some black Sugru into little balls and sticking them on the bottom, the device now has a nice cushion of air between itself and the surface it occupies. At this point, I had the bug. There’s a cabinet in our house that never stays shut. It’s old, the latch is misaligned and the humidity of summer makes things even worse. There’s a perma-gap that lets the door swing freely. Sugru to the rescue! I applied enough white to fill the gap, let it harden and now the door stays shut and only opens when we want it to. Wonderful. The only caveat I found was that, once a pack is opened, you best use all it contains. I was unable to re-seal a pack and even putting it in a tiny zip-top bag — with as much air pushed out as I could manage — didn’t prevent the leftover from hardening into a solid, unusable slab. Fortunately, each pack contains just 1/17th of an ounce, so it’s easy to use the whole thing. In the end, it’s great stuff. It’s occasionally obvious that you’ve used Sugru, so if a clean look is what you’re after you might be a bit bothered by the homemade look of your fix. Color matching helps, as long as you have the colors required to mix your target color. 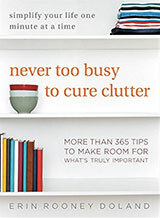 I like it, though, because it can help prevent slightly broken things from becoming clutter. 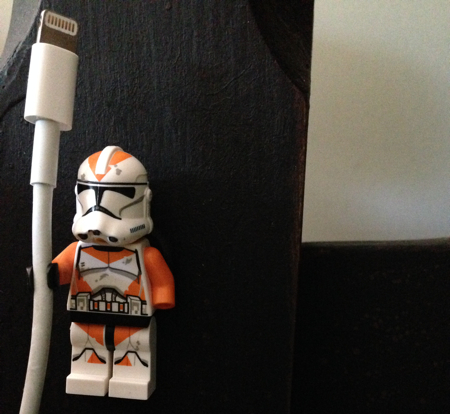 Be sure to check out the Sugru gallery for more ideas for how the product can be useful around your home and office. 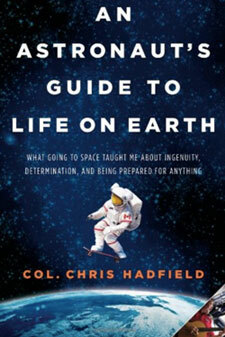 I just finished reading An Astronaut’s Guide to Life on Earth by Col. Chris Hadfield and found that it contained some great tips from outer space that we can use to be organized right here on Earth. In space, if you don’t hang on to them, things like spoons, pencils, scissors and test tubes simply drift away, only to turn up a week later, clinging to the filter covering an air intact duct. That’s why there’s Velcro on the back of just about every imaginable item: so it will stay put on a Velco wall. Things on Earth don’t exactly “float away,” although sometimes it feels like they do! There are several strategies that we can use to help things stay put! Consider using Velcro to stick markers and an eraser to a whiteboard. A Grid-It organizer can be placed in a drawer, backpack, or briefcase to stop smaller items from disappearing to the bottom of a bag. A pegboard won’t stop items from floating away, but it clearly identifies where items belong. Pegboards are ideal for tools, craft supplies, and even accessories such as jewellery, belts, and purses. Previously on Unclutterer, we’ve discussed creating a home inventory. Inventories are important because they indicate how much homeowners insurance you should carry and also help identify items that may be missing or damaged if your home suffers from theft or other disaster. Inventories done on a regular basis help ensure your items aren’t past their due dates (e.g. fire extinguishers, canned food) or have become obsolete (Do you need to keep the baby gates if your children are teenagers?). Regular inventories help you figure out how much of certain items you are using so you can prevent product shortages and keep just enough inventory on hand without having too much. I can imagine that an accurate inventory is even more important for the astronauts and cosmonauts since the nearest convenience store is 205 miles away. Items must be ordered in a timely manner so they arrive when needed and there are only a limited number of items that can be sent on each flight to the space station. Planning in advance is essential. Dropping pet treats on the floor is EXHAUSTING! Thankfully, the Unique Petz Treat Launcher “saves” you the hassle. In his book The Checklist Manifesto, Dr. Atul Gawande made a strong case for the power of checklists to help us “get things right” — including a checklist’s power to save lives when used by surgeons and airline pilots. But checklists can be useful tools for all of us, in many situations. On Unclutterer, we’ve written about checklists for moving, packing for travel, preparing for a trip, and requesting tech support. We’ve also provided a how-to guide for having a yard sale, which is basically a large checklist. The following four examples may give you ideas of other types of checklists you’d like to create and use. Many years ago, I almost bought a house with a key flaw: the house had very few walls without windows or doors, and there would have been no good place to put any bookshelves. After that experience, I created a checklist with everything I could think of that mattered to me in a house. I could still choose to buy a home that didn’t have everything I wanted, but at least it would be a conscious choice. If you want to create your own home checklist, you could use the wishlist and the checklist (PDFs) from the U.S. Department of Housing and Urban Development (HUD) as a starting point. The same basic type of checklist could be created for any major purchase: selecting a school or a camp, buying a car, etc. When I was buying a car four years ago, my checklist included price, reliability, miles/gallon, length, turning radius, acceleration, and the opinion of trusted reviewers. Make a carbon copy. As Husted explains, that “copy” could take many forms: a backup of a file, a drawing of some wiring, etc. Be lazy. Take a lot of breaks. Try the easiest and most obvious first. All these years later, this still seems like a good checklist to me. This is the packing list concept applied beyond trips and suitcases: for going to the beach, for attending a class, etc. Even if you keep a packed bag at the ready for such activities, having a checklist is usually a good idea, too. With that checklist, you can quickly confirm the bag has everything on that list so you can replace anything that got used up or misplaced. The same type of what-to-pack checklist could be created for diaper bags, school backpacks, first aid kits, etc. It’s easy to forget everything you need to tell a doctor, or everything you’ll want to ask. Organizer Ramona Creel has a checklist to help patients prepare for a visit, so they do remember everything they want to discuss. The U.S. Department of Veterans Affairs also has a checklist (PDF) of questions to ask a healthcare provider, which could certainly be used by patients who aren’t veterans, too. While not all items listed will apply to all visits, the checklist helps to ensure you don’t forget anything important. 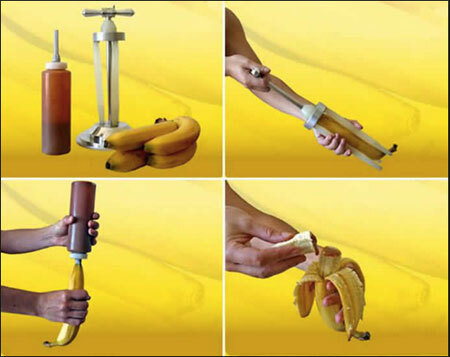 For starters, this device does nothing else and won’t work with bananas that have a lot of curve to them. Additionally, I think a straw would do the same thing if you really are fond of this idea. Or, you could dip the banana in a sauce and not waste part of your banana. And, finally, let’s not forget the most obvious thing here that injecting sauce into a banana transforms it from a health food into a tube of pure sugar. Anyone else craving a banana split now? Wake the kids and tell them to grab their backpacks: it’s time to go back to school. This can be a stressful time for kids and parents, but a little preparation goes a long way. In Part 2 of our back-to-school series, I’ll highlight some ways technology can ease the transition from summer. Of course, some schools will embrace social technology more completely than others. Colleges and universities seem to be the most aggressive, but even elementary schools are using the technologies available to them. If your school/district/child’s teacher is using websites, be sure to bookmark the sites and/or add them to an RSS feed so you can easily access the information for future reference. Most schools publish a calendar for parents and students to review, and many offer the opportunity to subscribe electronically for immediate updates. The Salt Lake City School District is a great example of a digital calendar, with instructions for subscribing to it with Apple’s Calendar, Google Calendar, and Outlook and Yahoo Calendar. 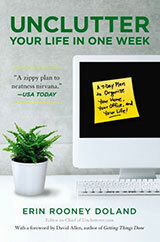 Once you’re subscribed, you needn’t depend on the monthly printed calendars you likely have hanging on the refrigerator. I’ve written about IFTTT before on Unclutterer, and the start of the school year is another time to use this program. IFTT is an online service that lets you create actions, or recipes, to accomplish tasks for you, including custom notifications. For example, let’s say your district or teacher always uses adds a certain hashtag when composing tweets related to your child’s school or class. You could create a recipe that sends you a text message or an email whenever such a tweet is published. Or, you can have all of those tweets pushed to a Google document for a daily review. On the other side of the desk, IFTTT is a terrific resource for teachers and schools. Communications with students and parents can easily be automated. Here’s hoping you have a successful school year. There’s more to do to get ready, of course, but these technology tips are a good place to start. Based on where you live, your kids may have already headed back to the classroom or they’re preparing to go in September. If you’re a student, you might be in the same boat. This transition period doesn’t have to be a stressful time. Households that have established routines are extremely beneficial for children and parents. Being prepared will bring peace of mind and make everyone’s transition from summer days to school days easier. Practicing the routine in advance is especially important for children who are just starting school or who will be starting a new school. By doing a few trial runs before the school year actually starts, you’ll be able to determine if there are any problems with the new routine before the first day. If your children are starting a new school, walk or bike with them on their route. Point out areas where there is heavy traffic and where drivers may have difficulty seeing pedestrians. Indicate safe havens where children can find assistance or a telephone if needed (e.g. convenience stores, public offices, houses of worship). Map out an alternate route home in case of emergency. If your child takes public transit or a school bus, create a plan in case the buses are late or if your child misses his/her stop. Turning off the TVs and computers at least an hour before bedtime will allow you and/or your kids to get organized for the next morning. Make lunches (if you didn’t make them when preparing dinner) and gather school supplies together. You can even set plates, cups, and silverware on the table for breakfast. Hang backpacks on hooks near the door so kids will know exactly where to find their stuff and where to put it when they get home. Make an inbox where they can put all the paperwork for you to fill out and sign. You can create one inbox for all the children but one box per child may work better, especially if the children attend different schools. Every year the school requires information such as health card numbers, vaccination schedules, emergency contact numbers, etc. If you know where all this information is, you’ll be able to fill out all those forms quickly and easily. Once filled out, make a copy of the paperwork for yourself. It will be easier to find the information for next year. Stocking up on supplies will save you from running across town to the 24-hour (expensive) pharmacy. While the sales are still going on at retailers, gather pencils, markers, notebook paper, and other supplies you and/or your children will need this entire school year (that is, if you have the space to store these items in an uncluttered way) Also, don’t forget items such as bandages, cold medication, and even lice shampoo that may be needed during the first weeks back. While older children may benefit from doing homework in their bedrooms at a desk or in the home office, younger children who need parental support to do their homework in the kitchen or dining room while their parents are preparing dinner. Wherever the homework zone is located, make it easy to use and easy to put away supplies. Use a binder with sheet protectors to contain important information such as the school phone numbers, a list of phone numbers of friends of your children, the list of parents who carpool, menus from the local take-out restaurants, etc. You’ll be able to find what you need this school year exactly when you need it. Purchase transit tickets and taxi vouchers in advance, if necessary. Fill a jar or bowl with coins and small bills so you won’t be scrounging for lunch money at the last minute. Enter all of the school holidays and pedagogical days on the calendar as soon as the information is received from the school so that you can arrange for daycare or other activities as soon as possible. In Part 2 of our back-to-school series we’ll go into more detail about creating a digital calendar and in Part 3 we’ll explore using a paper calendar with younger children.